Luncheon & Tea Rolls. 2 quarts flour 3 c. boiled milk 3 tbsp sugar 1 tsp. salt 1/2 c. butter Whites of 2 eggs 1/2 yeast cake. Boil the milk, dissolve in it the sugar & salt, and add the butter to melt it. 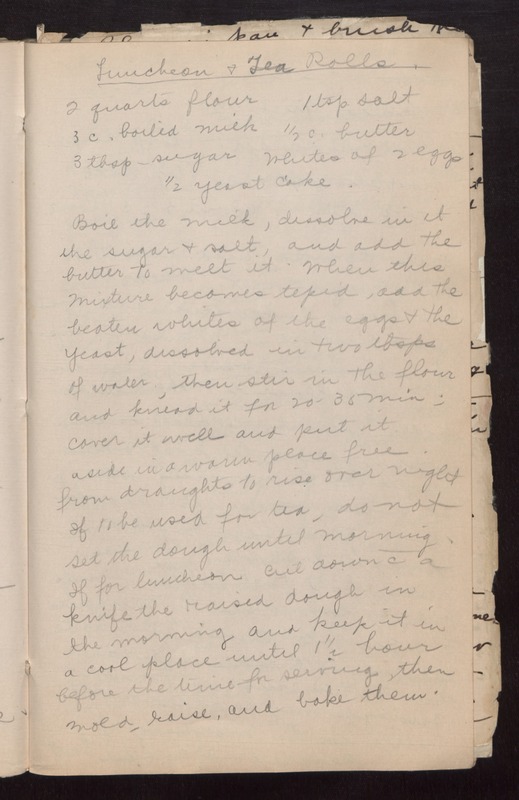 When this mixture becomes tepid, add the beaten whites of the eggs & the yeast, dissolved in two tbsps of water, then stir in the flour and knead it for 20-35 min; cover it well and put it aside in a warm place free from draughts to rise over night If to be used for tea, do not set the dough until morning. If for luncheon, cut down /c a knife the raised dough in the morning and keep it in a cool place until 1 1/2 hour before the time for serving, then mold, raise, and bake them.